Now in its 18th year, the Gensler Design Excellence Awards (GDEA) program sets a standard that all our design teams can aspire to. Within our global firm of more than 5,000 employees, the program serves a vital purpose: to nurture and elevate our design culture. Each year, the projects selected for GDEA recognition pass through a rigorous review process. It starts with staff members gathering in each of the firm’s 10 regions to critique projects from outside their region. Often these gatherings are organized as social events where the entire office comes together to review pin-ups of the entries and cast their votes for the top projects. This gets everyone involved in the process and stimulates discussions among our designers all over the world. 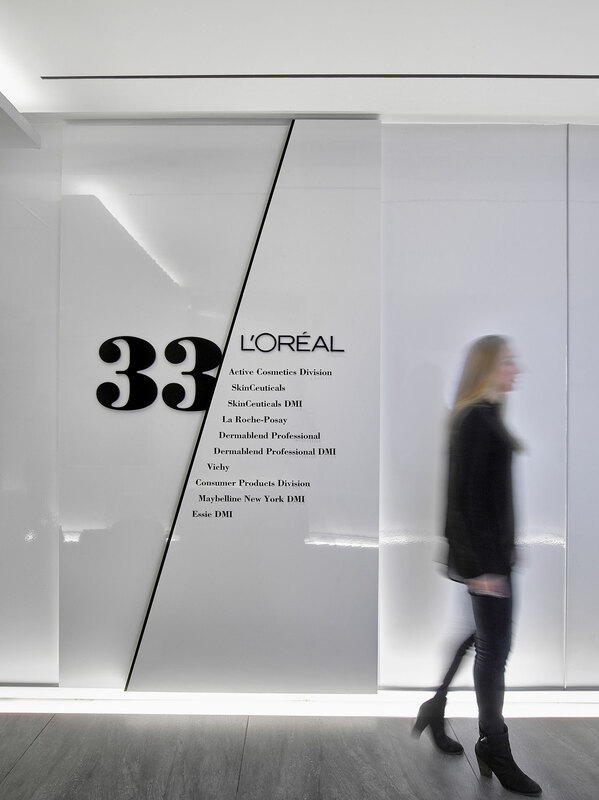 L'Oréal USA Hudson Yards is the catalyst for cultural change, unifying 32 brands that had previously operated and identified themselves as individual brands. The projects come in many forms: architecture, interiors, product design, planning, brand design and more. The regions’ picks are vetted by the firm’s design leaders. Then a shortlist of about 130 projects is critiqued by a jury of industry experts composed of architects, designers, entrepreneurs, developers, academics, brand leaders and editors from outside the firm. They deliberate over which projects to select for recognition and then share their insights during a live broadcast to the entire firm. In 2017, the pool of entries embodied the many ways that Gensler uses design to improve the human experience — a reflection of the program’s theme, “Transforming Everyday Experiences.” The entries were sorted into three categories that align with Gensler’s community, lifestyle and workplace sectors. Within these categories, the submissions were also separated so that large, complex projects — as well as smaller, easier-to-resolve ones — received equal attention. Completed projects were reviewed separately from those that are not yet built. The work they reviewed varied widely in location and scale, including L'Oréal USA Hudson Yards, an interactive workplace with specialty spaces designed to engage with consumers; Hotel Chaco, an innovative boutique hotel in Albuquerque that interprets the rich heritage of New Mexico in a contemporary aesthetic; and El Bosque Transitional Shelter for Senior Citizens, a new residential building in Costa Rica with dignified spaces for leisure and hospitality. 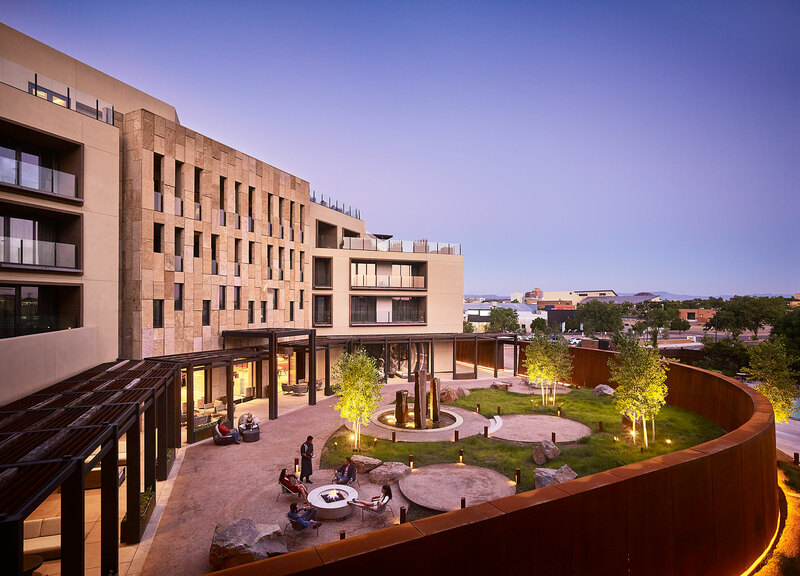 Hotel Chaco is rendered in a Pueblo Modern vocabulary, blending the legacy of Puebloan culture and the imagery of Chaco Canyon’s indigenous ruins to create a restful sanctuary. Twenty other projects received awards, highlighting a broad cross-section of the firm’s work. These projects included Cadillac House, an immersive brand experience in New York that merges physical with digital, and hospitality with theater; E. & J. Gallo Winery Dry Creek Building, a purpose-driven office building in Modesto, California, that respects the company’s belief in preserving and enhancing the land; and Westminster Provisional Parliament, a proposal for rehousing components of the UK Parliament temporarily within a prefabricated structure over the River Thames. One of the longstanding traditions of the GDEA program is a special category called the Margo Award, named for respected Gensler leader Margo Grant Walsh, who is now retired. The award recognizes projects that achieve design excellence through cost-effective solutions, often through the inventive use of off-the-shelf components. Base Camp, the temporary quarters for Gensler London, was built on a shoestring budget. But it provides for the kind of adaptive, multi-functional space that the office uses to maximum effect. 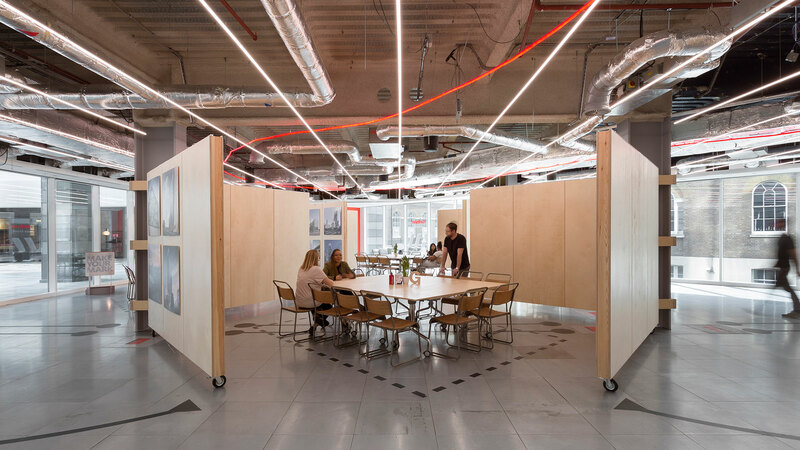 This year’s Margo Award was given to Base Camp, the new temporary office for Gensler London. Economical and modular, the design is an adaptive space for creatives — reconfigurable to accommodate a variety of functions, from single-use to multiple activities occurring all at once. It’s a space to collaborate, exhibit our work and host events. A Texas-based initiative was selected to receive the Social Impact Award, which celebrates design excellence for projects that give back to our communities. It recognized Houston ByDesign, a series of design studies intended to stimulate conversations about Houston’s physical environment. The series focuses on the impact designers and urban thinkers can have locally and beyond, featuring work by people who are asking “What if?” or “How can we make a difference?” ByDesign’s projects range from master plans to buildings, and from international competitions to informal studies. 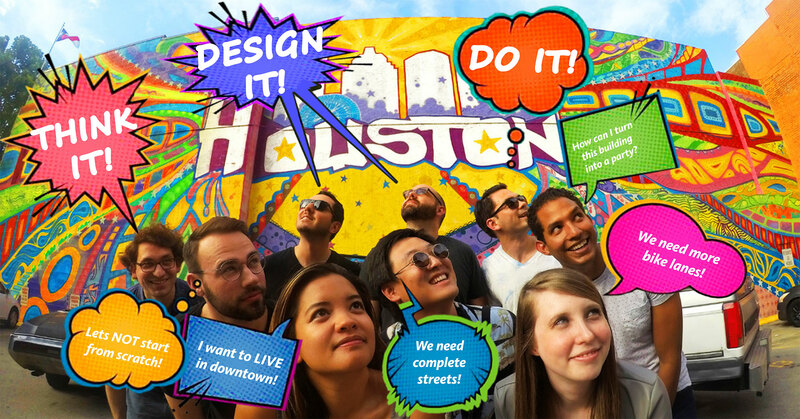 Team members from Houston ByDesign explore a wide range of projects focused on the needs of the city — and beyond. The series is an invitation to think critically and creatively about the built world.